Other: Translated from French. Won the YALSA Best Fiction award for YA Readers in 2011. At thirteen-years-old, with an unusually high IQ and a knack for observing things about other people, Lou Bertignac is not only the youngest in her class at school; she is also the most unusual. Painfully shy, she has few friends, save for Lucas, whose company helps her get through each day. At home, Lou's life is also difficult: Her mother hasn't left the house in years and her father spends his days crying in the bathroom. Lou's world is dark and sad... That is, until she meets No. No is a teenage girl that Lou befriends for the purpose of her school project on homelessness. Despite the different worlds that these two girls come from, a friendship is soon forged between them. Unable to bear the thought of No not having a home or a family to keep her safe, Lou persuades her reluctant parents into letting her new friend stay with the Bertignac family. No's addition to the household forces Lou and her parents to face the sadness that has been enveloping them for so long — but not without some disruptions along the way. Lou is a thirteen year-old girl with an IQ of 160 and a habit of comparing and observing things, looking for connections. She's a loner at school, only befriending Lucas, who is the complete opposite of her: he's tall, cool and popular, while Lou is small and overlooked. Then Lou meets No. No is a teenage girl who lives out on the street. She agrees to do an interview with Lou for her assignment on the homeless and they become friends. Eventually, Lou asks her parents to take No in. They do. And it changes their lives. The book starts out by telling about Lou, who is very smart, and her broken family. Her father works hard, but cries in the bathroom when he thinks Lou isn't listening, and her mother hasn't left the house in years. All because of a terrible loss that they never learnt to deal with five years ago. Lou is shy and keeps to herself, until she meets homeless No at a station. They talk and agree to meet again later on. This is how their relationship is born - I wouldn't go as far as calling it a friendship already. Eventually, Lou asks her parents if No can come and live with them because she hates the idea of No suffering from the cold while they have a room to spare. They take in No and at first it seems to be working. Everything seems to be going fine: her mother starts to pick up her life again and they are really like a little family with the four of them. But underneath the surface, other things are brewing and everything's not so perfect. This book had me thinking about the story for several days. While reading it, it took me some time to get into it. But when I did, I was intrigued by the mysterious friendship that was building. Lou was working really hard to make live easier for No. You can take a girl off the streets, but can you get the streets out of the girl? The translator left several errors in the book, which bothered me when I saw them. But other than that, I really liked reading this book. It wasn't exactly written in chapters, it appeared to me that it was written in flashes of how Lou experienced things and I liked reading it that way. 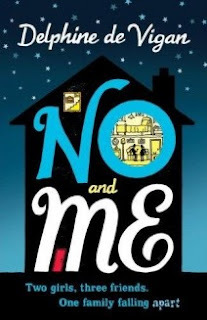 No and Me was unlike every other book I've ever read. Because of the plot and the issue of the homeless, but also because of the not-so standard plot and because it made me think for several days. great review, I've heard of this one before and loved the sound of it then. it's definitely one for my wishlist!